In stitch dictionaries! I love to look at the different patterns and imagine all the possibilities. Once I settle on something, it's a matter of finding a good fit between stitch pattern, garment style, and design details. Cables, definitely. I also like lace. Originally I designed for myself (I really am pretty average) and graded sizes up and down from there. In recent years I've expanded my size range, although designing for larger sizes can be challenging. The shaping for larger sizes is such that it's almost like grading a completely different pattern. But I know the demand is out there for expanded size ranges, so I will include them as much as I am able to. I have a whole stack of knitting magazines here on the floor of my office that I haven't looked at. I prefer not to be influenced by anyone else's designs. One of these days, though, I hope to have enough time to knit some designs by other designers! 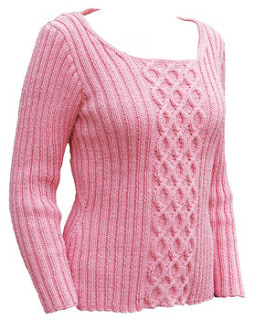 Designers walk a fine line when writing knitting patterns. On the one hand, we want to include sufficient information that a knitter can completely reproduce the garment we designed. On the other hand, it's a knitting *pattern*, not a reference manual on techniques. I often think we've gotten lazy as a society, and want everything handed to us so that we won't have to get up, walk over to the bookshelf, and take down a good knitting reference book and read about a technique. Now I sound like an old person but when I was learning to knit (and design), I had only two books, no Internet, and no other knitters around who could help me when I got stuck. I think it made me a better knitter to have to figure things out on my own. I have two regular test knitters who work for me. Each of them usually does three or four items a year. I am really picky about my knitting and especially the finishing, so I usually do the finishing myself. I don't have a written one, but I keep my own books and the books for my husband's construction company, so I am really good at seeing trends and making adjustments throughout the year. I have a list of goals I want to accomplish, although sometimes I get sidetracked. This year, for example, I've done way more traveling and teaching than I normally do, and I was gone so much that I didn't get the second Cables book finished as I had planned to do. And things change. Fiber Trends is now distributing my patterns. Twists and Turns®: The Newsletter for Lovers of Cable Knitting seems to have run its course, so it will cease publication at the end of 2010. We'll have to see what else is in store! Joan Schrouder and Lily Chin have both been great sources of advice for me over the years. I also run a Yahoo groups list for self-publishing designers, and they have been a wonderful support network. Not really; I come from a long line of self-employed entrepreneurs. My mother started her own metal-stamping company in Cleveland when she was 55 years old. She's also a great source of business information. Some good, some bad. The Internet has made it MUCH easier to reach knitters directly; I think it would have been much harder for me to produce and market "Twists and Turns®: The Newsletter for Lovers of Cable Knitting" without a website. On the other hand, the ease of connecting with knitters has unleashed a whole flood of people calling themselves knitting designers. It used to be that knitting designers were the ones who had their work published in magazines or had written books or had been vetted by the industry in some way. Now just about anyone can call him- or herself a designer. That's great for people trying to break into the industry--it's much easier now--but there is a wide range of standardization (or lack thereof) and quality when it comes to patterns. And as much as I like Ravelry, I've found that it's reinforced the culture of wanting things for free. As a designer who produced a cable knitting video, it's sometimes disheartening to log onto Ravelry and see all the knitters asking where on the Internet they can see a video for a technique. It's very hard for those of who charge for our work to compete with "free." I think we're really close to a tipping point in this business, where only a very few people (even fewer than in the past) will be able to support themselves as knitting designers. The pie can only be sliced into so many pieces, and the pie is getting smaller all the time. And the economic situation hasn't helped. ABSOLUTELY. My tech editor is critical to the success of my business. It's getting a bit easier now that my kids are older. But I am pretty aware that I am a workaholic and I have to remind myself that I need to take some time off now and then. This past year I began getting once-a-month massages. They originally began as a treatment for a sore shoulder due to knitting, but I've found that they help to keep me from getting too stressed out. I'm getting better at not being so thin-skinned, but it's hard. I try to remind myself that most people mean well. Hmmm, the business has been self-supporting for about 10 of the 13 years I've been doing this. For the past couple of years I've been able to contribute in a significant way to the household expenses--my husband is a builder and here in Montana he might not work for a few months during the winter. When that happens, Big Sky Knitting Designs supports the family. This year, though, income is down. I've had to go back to work as a substitute teacher during the week. I think it's a combination of the economic meltdown and the fact that more and more knitting information is available on the Internet. Make sure you have a good day job. :-) No, seriously--being an indie designer is no different that being a self-employed builder, or metal-stamping plant owner, or any other kind of self-employment. You may think it's knitting 24/7, but the reality is that owning a business comes with a lot of responsibilities, not all of which are fun. Know yourself, know what you like to do, and be prepared to pay someone to do the things you don't want or like to do. And enjoy the flexibility and the freedom to do what you love. I love Janet Szabo's designs, tutorials, and books. I have a couple of her books, and have been dreaming of designing my own sweater based on her instructions.